Aftermath Norway - Is the counterjihad to blame? A lone Norwegian "counter-jihad" right-winger decides to slaughter left-wingers, in the worst terrorist attack in the West since Madrid. All of the counter-jihad figures he cites as influences disown and despise him. None of them ever supported anything like this. In no sane world does opposing terror attacks on the West logically lead to carrying out terror attacks on the West. The killer is no different to an Islamist jihad terrorist. He bombs the elected democratic Norwegian government and Oslo civilians. Targeting the centre-left government is incredibly extreme - they support the Afghan War and the Libya War. He then carries out the most sadistic, barbaric attack against children at a mainstream, centre-left, politicial summer camp. His attack targeted children who had nothing to do with policy, and was incredibly sadistic, hunting them down and executing them close up. The Norway attacks, 22 July 2011. A right-wing, anti-jihad terrorist kills 77 in Norway. Worst terror attack on the West since Madrid in 2004. Worst right-wing terror attack since Oklahoma in 1995. An anti-Islamic terrorist kills more people than in all Islamic terror attacks on the West in 2006 to 2011 combined. William Nygaard (Salman Rushdie publisher) sued in Oslo city court for blasphemy against Islam, 1989. Arson attack on bookstores in Oslo, 1989, over Rushdie affair. William Nygaard (Salman Rushdie publisher) shot in Oslo by Islamists in 1993. Oslo synagogue shooting in 2006. Muhammad cartoons terror plot by immigrants to Norway from China, Iraq and Uzbekistan. Arrests July 2010. Convictions Jan 2012. Should the counter-jihad feel guilt about this monster Breivik? Well, when he took part in public counter-jihad discussions on document.no up to Oct 2010, he seemed fairly mainstream. There is nothing that would make one call the police. He was right-wing and anti-jihad, yes, but he was not a neo-Nazi (he was pro-Israel) or a white supremacist (he opposed the BNP because they are racist). He was Christian, but not a fanatic (he was pro-gay). In fact he was apparently like me - liberal right. He was anti-racist, pro-gay and pro-Israel. So how on earth did someone like that become a terrorist against the West? It seems he changed on his own after Oct 2010. His manifesto, released at the time of the killings in July 2011, is radical, extremist and violent. It is openly pro-terror. It openly talks of carrying out terrorism against the left. It is like it is written by a different person. In his manifesto, he is a loner, with no supporters. He has decided that he alone, in silence, must start this war. In contrast to jihad attacks, no one is cheering him on. No one (except jihadists) celebrates the attack. Deciding he had to go and kill left-wingers is his own interpretation of counter-jihad material. The authors themselves do not agree with him. I would give him the death penalty. (Though Norway won't. They have not executed anyone since 1948.) And I would be very careful that he has no followers or accomplices. But it would be wrong to blame the counter-jihad - or at least, the mainstream, democratic, non-violent counter-jihad voices that he cites. It would be wrong to use this as an excuse to stop speech criticial of the jihad and sharia. Breivik is a great enemy of the counter-jihad, not an ally. My quote in yellow has caught the imagination of various leftists, as they try to blame the normal counterjihad for Breivik. But of course the answer to my question was clear within days of the attack: Breivik changed and by 2011 was not remotely like the person seen on document.no. There is no mystery. He was not a normal counterjihadist who started shooting. 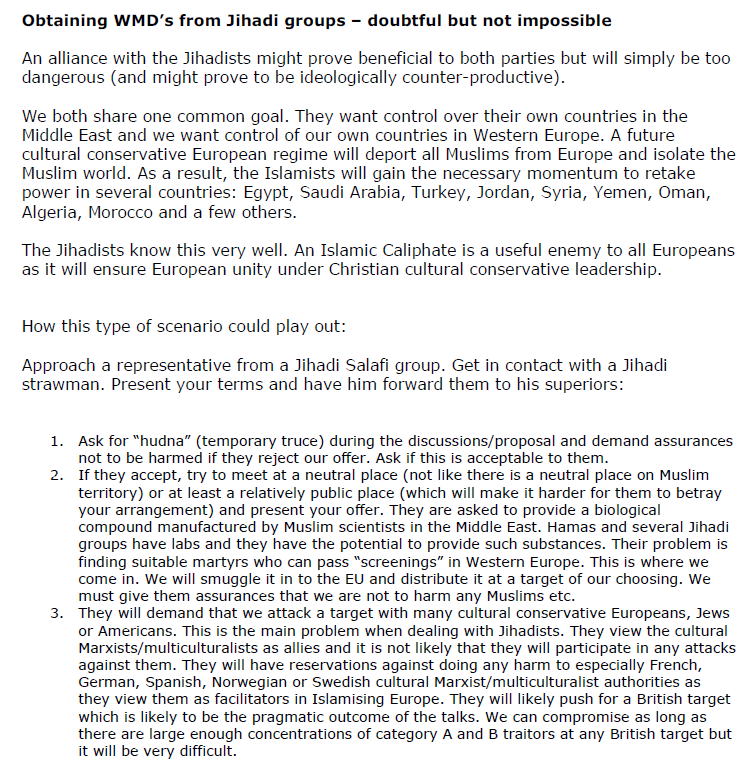 The killer's anti-jihad online comments on document.no in 2009-10 are strangely moderate and mainstream. There is nothing to indicate a racist or fascist. And nothing to indicate a mass murderer in waiting. The English-language extracts here are from the Google translation of his comments. Copies here and here and here and here. He seems fairly moderate. He is anti-racist: "Ethnocentric movements [like] BNP, National Front [are] not successful and will never be able to get over 10% support ... One can not fight racism (multikulti) with racism. ... Ethnocentrism is therefore the complete opposite of what we want to achieve." Even his opposition to Islamic terror is moderate. He tries to say Islamism rather than Islam: "Islam (ism) has historically led to 300 million deaths". 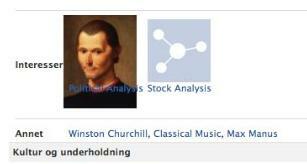 Nothing posted in public in 2009-10 shows a mass murderer in waiting. This is incredibly strange. document.no statement on the killer: "That Behring Breivik classified [the Frankfurter School] as cultural marxists indicated that he did not really know cultural history. But that does not make him an extremist. Actually there is nothing in Behring Breivik's writings that indicates that he was violent. His thoughts about multicultural society are run of the mill on the political right, with some personal eccentric ideas, i.e. the use of the word conservatism. ... He argues against ethnocentrism and says the answer to racism cannot be another form of racism." He was no neo-Nazi. He was a member of the fairly normal conservative Progress Party, the second-largest party in Norway. Chief of Norway's intelligence police agrees that Breivik was not extreme in his views on the Internet: "He has also deliberately desisted from violent exhortations on the net. He has more or less been a moderate, and has neither been part of any extremist network." Breivik's Facebook page is very strange. It shows nothing to indicate a potential mass murderer. 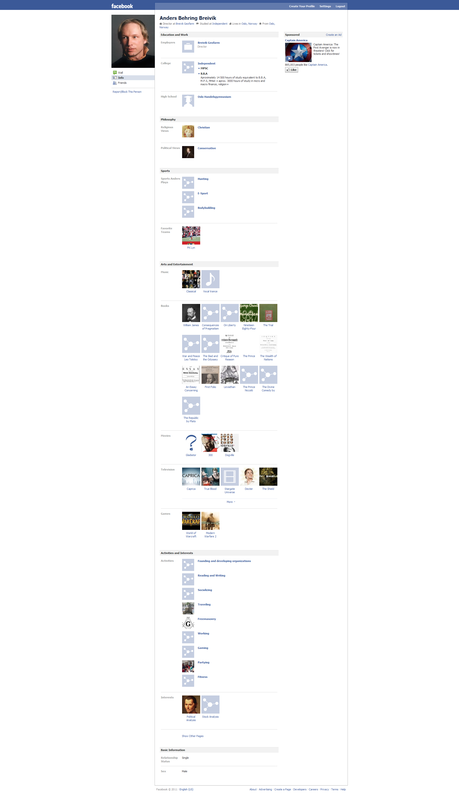 However, it seems it replaces an earlier, deleted page. It would be interesting to see that. His manifesto talks of: "my former 7000 patriotic Facebook friends". 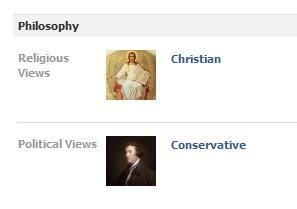 He admires Jesus and Edmund Burke. He is a fan of Winston Churchill and Norwegian anti-fascist hero Max Manus. You can only imagine what Max Manus would say about this sadistic killer of Norwegian children. The killer's manifesto, "2083: A European Declaration of Independence", released only on the day of the killing, is truly terrifying. It is openly pro-terror. It openly talks of carrying out terrorism against the left. It is like it is written by a different person to the one on document.no. Robert Spencer and Jihad Watch. Pamela Geller and Atlas Shrugs. But this time none of these people (even LGF) would recognise the ideas in it. None of these people have advocated terrorism and totalitarianism like this document does. Forced deportations: "Deportation policies: All Muslims are to be immediately deported to their country of origin. Each family (family head) will receive 25,000 Euro providing they accept the deportation terms. Anyone who violently resists deportation will be executed." Mass killings and deportations: "When we seize political and military power in the future; while tempting to unleash hell to avenge all our ravaged and dead brothers and sisters, ... we must think and act pragmatically with a long term objective. ... As such, we should limit the executions of category A and B traitors to 200,000 in Western Europe. A better alternative than execution of the remaining, the category C traitors, would be to establish a large multiculturalist zone in southern/eastern Europe, perhaps Anatolia, or on other territories which has been invaded and occupied by Muslims. In these newly created zones; the cultural Marxists category C traitors and those of the non-Europeans considered as politically disloyal will be deported to and allowed to live and create their imaginary utopia." Forced conversion to Christianity: "Assimilation policy/demands/offer for Muslim individuals living in Europe (this offer will expire on Jan 1st, 2020) ... Convert to Christianity (Orthodox, Catholic or Protestant). Every individual is to accept baptism, the ritual act by which one is admitted to membership of the Christian Church ... Attempt of al-taqiyya (Islamic deceit) for shorter or longer periods in order to try to wait for a regime change will not be tolerated. The convert will celebrate Christian holidays and adopt mainstream Christian customs and has to attend Church at least once a year ..."
Destruction of heritage: "All mosques and Islamic centers will be demolished or converted ... All Islamic and/or Arab-style or equivalent buildings/artwork will be demolished or modified All traces of Islamic culture in Europe will be eradicated, even locations considered historical." Plans for terrorism: "I have been thinking about my post-operational situation, in case I survive a successful mission and live to stand a multiculturalist trial. When I wake up at the hospital, after surviving the gunshot wounds inflicted on me, ..."
Planned terrorism against the left: "A prioritised target is the annual party meeting of the socialist/social democrat party in your country. ... An entry strategy might be to use fireman's clothing when entering the building. This allows you to conceal your armour and weapons under the fireman's coat ... An alternative approach would be to deploy mobile bombs at strategic places outside the main entrance". The story of Breivik is ultimately the same story as that of jihadist revolutionaries. It is the story of the temptation of utopian totalitarianism and the cleansing power of violence. For all his protests, Breivik is no different to the jihadists, and should be treated the same as them. Poorly researched articles will probably be written forever claiming that Breivik's views were known before the massacre. In reality, his manifesto was released only on the day of the killing. Before this, Breivik had said nothing very unusual online. Shahla Khan Salter, 15 Aug 2012, gets away with publishing this distortion: "Breivik was open about his views before the attack. ... Where were the police?" This is nonsense. Breivik was not open about his views before the attack. If he had been, he might have been stopped. It seems unlikely that the Breivik attack is the start of some wave of right-wing terror. Breivik seems more like a loner with mental problems than a member of any group. Breivik was a very strange terrorist. A "defender" of the West who carried out terrorist attacks against it. A Norwegian "patriot" who bombed Oslo like Al Qaeda would. A violence-worshipping terrorist guerilla who quotes a load of stuffy parliamentary thinkers who despise revolutionary terror. Roland Shirk is baffled at Breivik's sources all being non-violent: "Move to the sources Breivik cites and the cognitive dissonance deafens: Stuffy Burkeans like the Intercollegiate Studies Institute; campus journalists like the Collegiate Network; measured critics of Islam like Daniel Pipes and Bat Ye'or. Indeed, the person serving as media scapegoat for Breivik's atrocities, my friend Robert Spencer of Jihadwatch, is a mild-mannered scholar who urges only peaceful, constitutional activism. ... [Breivik's] critique of the European Union echoes those of tweedy, harmless British Tories. ... Breivik's writings quote only the most sophisticated, non-violent, non-racist sources. There are plenty of neo-Nazis and racialists out there whom he could have cited, the kind of sources most mass killers find appealing. When Timothy McVeigh committed mass murder in Oklahoma City, the inspirations he cited for his hostility to the U.S. government were not works like Frederic Bastiat's The Law, but bloodthirsty racist fantasies like The Turner Diaries." It does not make sense that Breivik cites non-violent sources. Can anyone explain it? Mark Steyn points out that it was a rather strange "Islamophobic" attack: "So, if a blonde blue-eyed Aryan Scandinavian kills dozens of other blonde blue-eyed Aryan Scandinavians, that's now an "Islamophobic" mass murder? ... No mosque was targeted in Norway. A member of the country's second political party gunned down members of its first. But, in the merest evolution of post-9/11 syndrome, Muslims are now the preferred victims even in a story in which they are entirely absent. ... A rambling Internet pdf is trumping the facts on the ground - trumping the specifics of what occurred, and the victims. This man Breivik may think he's making history and bestriding the geopolitical currents and the clash of civilizations, but in the end he went and shot up his neighbors." On the killer citing peaceful parliamentary democrats as he slaughters: "Any of us who write are obliged to weigh our words, and accept the consequences of them. But, when a Norwegian man is citing Locke and Burke as a prelude to gunning down dozens of Norwegian teenagers, he is lost in his own psychoses." "In a striking number of cases Breivik doesn�t make logical sense even when read on his own terms. ... Breivik repeatedly stresses that he is against �racism,� yet later in the manifesto he suddenly decides that race does matter after all. ... Breivik is the anti-Nazi who admires neo-Nazis, the anti-Marxist who admires Marxist revolutionaries, the anti-Islamist who openly admires and emulates Islamic Jihadist terrorists, the non-religious person who thinks he will be canonized as a saint by the Catholic Church ... Breivik is consistently inconsistent, or very nearly so. He contradicts himself so frequently that it�s hard to keep track of his basic ideas, if he has any at all apart from glorifying his own person through murder." "It is hard to tell whether or not Breivik is insane." Breivik was declared insane by psychiatrists who examined him, Nov 2011. The prosecutors called for him to be declared insane, June 2012. Surprisingly, the judges disagreed with the prosecutors and declared him sane at sentencing in Aug 2012. As a loner, whose ideas make no sense, he seems ultimately insane to me. But it is hard to define what we mean by "insane". He is certainly a high functioning insane person. How did one gunman kill 69 people? List of rampage killers shows this is the worst single-shooter massacre in history. His targets were stuck on an island, and many were children: "At Ut�ya there are youth from 13 to 30 years old. The average age is around 16." Breivik was an evil man who needed to be stopped by brute violence. His victims were educated in a political philosophy that made it hard for them to recognise either fact. Apparently the children and youths were so full of anti-Israel hatred that some of them thought the shooting might be a simulation of Israeli crimes, meant to teach them how bad Israel is. And insanely, some thought talk was the answer. Some tried to talk to the killer and were immediately shot dead. The youngest victim was 14. Tony Allwright thinks young men of previous generations would never have allowed themselves to be slaughtered like this. See his "1950 Version (and earlier)" of how the shooting would have gone down. He may be right, but I wouldn't like to blame the victims, since I might have frozen with fear myself. None of us know what we would have done. I do note that some of them did fight back. The youth camp was anti-Israel and pro Islamic terror. Obviously this doesn't mean that they deserved to be killed. Many people in the West are anti-Israel and pro Islamic terror. The response to such people in a democracy should be more speech - not violence by unelected savages like Breivik. The group who suffered the terrorist attack at Utoya 2011 was the Workers' Youth League (Norway) or "AUF". The AUF have a long history of hostility to Israel and tolerance for Islamic terror. It is not justice that they suffered a terrorist attack. It is awful. It would be nice to think this would turn them against terrorists like Fatah and Hamas. But that is probably unlikely. Norwegian leftist Lars Gule (and translation) took part in an attempted terror attack against Israel in 1977. Gule was working for the DFLP, the terrorist butchers that carried out the 1974 Ma'alot school massacre. In 1984, Gule was made head of the AUF student branch at the University of Bergen, Norway. Gule confirms he was in the AUF in 1983-84. Leader of Oslo AUF calls for Hamas state visit to Norway, 2006: "Hamas has won the most democratic elections in Palestine's history, and the election results should be recognized with a state visit." AUF press release, 2008: "The AUF supports the Palestinian people in their struggle for liberation and the AUF will fight for an independent Palestinian state. ... The AUF suggests that the government should start working on an international boycott campaign of Israel." AUF leader, 2011: "The struggle for a free Palestine is part of the Norwegian social democratic soul". By "free" he does not mean with elections, and a parliamentary opposition, and human rights for women, gays, apostates and atheists. He has a different meaning of the word "free". AUF leader, the day before the attacks: "The AUF want a unilateral Norwegian economic embargo of Israel. The AUF wants a more aggressive Middle East policy and we demand that Norway recognize Palestine. Enough is enough." Alan M. Dershowitz, July 28, 2011: "Norway is the most anti-Semitic and anti-Israel country in Europe today. ... I know of no reasonable person who has tried to justify the terrorist attacks against Norway. Yet there are many Norwegians who not only justify terrorist attacks against Israel, but praise them, support them, help finance them, and legitimate them. The world must unite in condemning and punishing all terrorist attacks against innocent civilians, regardless of the motive or purported cause of the terrorism. Norway, as a nation, has failed to do this. It wants us all to condemn the terrorist attack on its civilians, and we should all do that, but it refuses to live by a single standard." Journalists' visit to re-opened Utoya island, 3 Oct 2011, shows the tolerance of its milieu for totalitarian violence: "This has been the first point of call for generations of young Labour Party participants. There is a homely feel inside with its white panelled walls. The only real political symbol is a white plaster cast bust of Lenin awkwardly perched on a black enamel heater." The left-wing AUF teenage and youth camp that Breivik attacked was calling for the boycott of Israel. Shameful, yes. But in a democracy, the answer to speech you disagree with is more speech, not brutal violence. But Breivik was not a democrat. He was a totalitarian. He has the same contempt for liberal democracy as jihadists have. 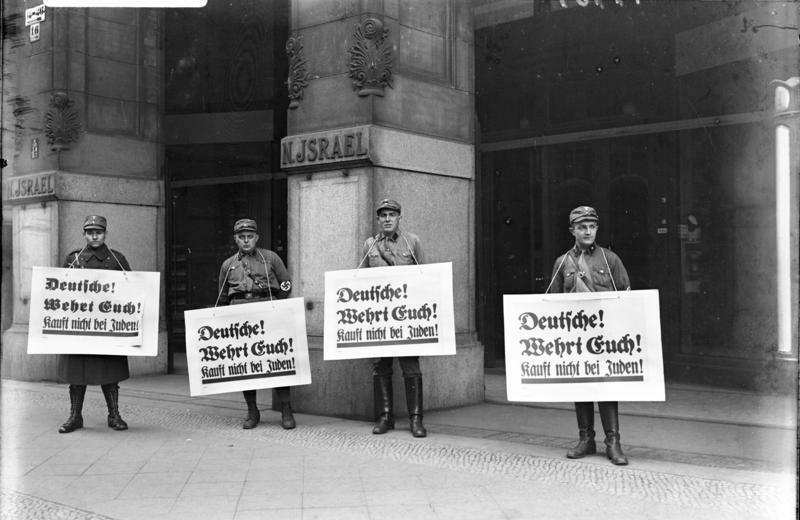 Nazi boycott of Jewish shops in Berlin, 1933. The placards say: "Germans defend yourselves! Don't buy from Jews." From here. And more images. You would think that Europeans would avoid any boycott of Israel because of its echoes of the Nazi boycott of Jews. But sadly no. 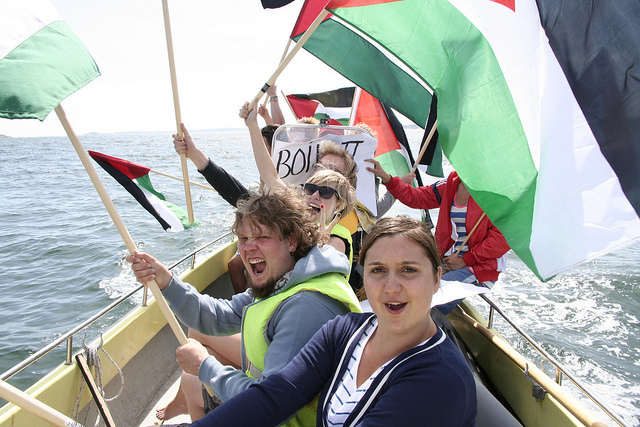 One of the "games" at the AUF youth camp was apparently "Break the Blockade", where the young people would try to sail "Palestinian" boats past an "Israeli" blockade. Shameful, yes. Obnoxious, yes. Young people with their heads full of nonsense, yes. But allowing this - and criticising it - is part of the basis of western liberal democracy. Suppressing such people - or their critics - means you are not a democrat but a totalitarian like Breivik. The above photo, widely distributed in 2011, is not in fact of Utoya 2011. 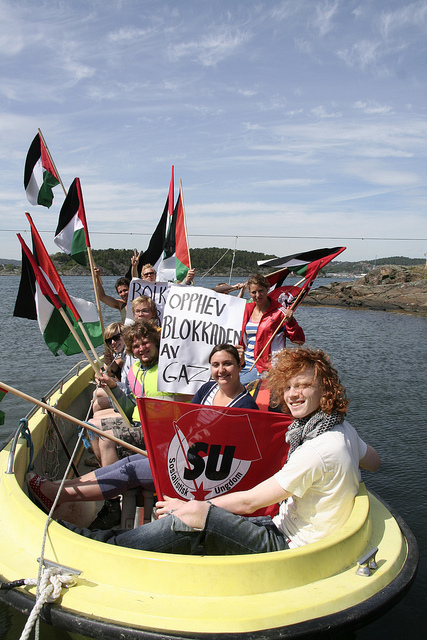 It is from here and appears among photos of Utoya 2010 by Socialist Youth (Norway). See another photo. These are a different Israel-hating group to the AUF. 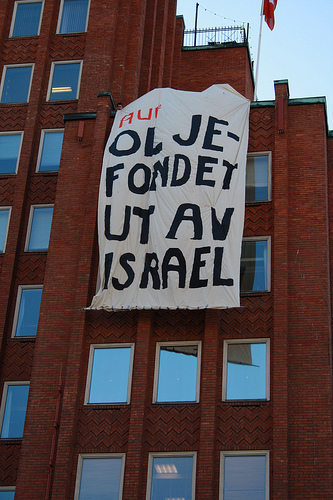 The AUF campaign against Israel in June 2010. They are complaining here about the Government Pension Fund having some investments in Israel. The banner says "OIL FUND OUT OF ISRAEL". Do such obnoxious ideas deserve death? Of course not. It is normal to have different ideas in a democracy. Everyone should have the right to say what they believe. Fatah Youth went to the camp: "It is with consternation that we have received the dramatic news of an awful terrorist attack against a summer camp ran by our comrades of Norwegian Labor Youth AUF ... 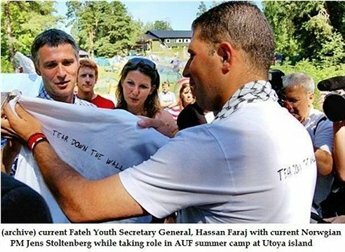 The Fatah Youth group had taken part in the summer camp in the past on the Island of Utoya ... Fatah Youth has participated for almost 15 years in the same summer camp". Of course, none of this means violence is justified. Breivik is still a sick, evil terrorist. But it sure is an unpleasant little fact. Ironically, given that Breivik is seen as a neo-Nazi killer of anti-fascists, we can find neo-Nazi hatred in AUF itself. AUF member's post on Facebook during the Israel-Gaza conflict, Nov 2012 (see translation) says: "Damn Jew whores ... wish Hitler could come back and shower you a little more". 40 of his friends (probably many AUF) "like" the post. 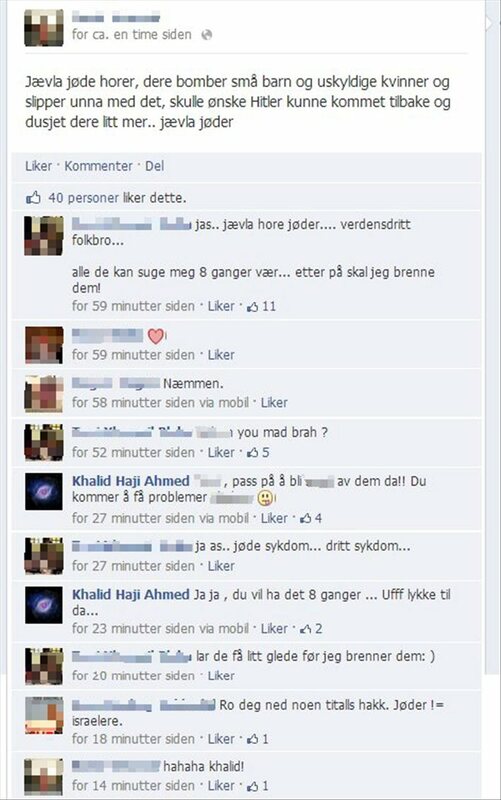 AUF senior member Khalid Haji Ahmed joins in humorously, and says something like: "Yes yes .. good luck with that". Ahmed is a Muslim from Somalia, and survived the Utoya massacre in which his brother Ismail Haji Ahmed was killed by Breivik. He later defends his comments unconvincingly. Breivik's mental illness has continued to develop since his massacre. He has been coming up with new insane statements. Breivik claims in a letter of Sept 2013, that he only pretended to be a counter-jihadist in order to discredit the counter-jihad movement, and his real allegiance is to neo-Nazism. He apparently "forgot" to say this between 2011 and 2013. Breivik in prison in Mar 2016 now claims he is a "Nazi". He says "I have fought for National Socialism for 25 years", which is obviously complete nonsense. Next year he will claim to have been an Islamic jihadi for 25 years. The man is mentally ill.
Breivik was a strange type of "counterjihadist" - one who wanted an alliance with the global jihad! The above is from his manifesto. In what sense is a rising fanatic Islamic Caliphate in the Middle East "useful" for Europeans and Israel? Nutcase. Not to mention his contempt for the Christians and minorities of the Middle East who would have to live under it. He proposes carrying out certain terrorist attacks in the West that are "acceptable" to the jihad. The anti-anti-jihad site Loonwatch said in July 2011: "Anders Behring Breivik is the polo sweater wearing anti-Muslim Right-wing nationalist Crusader icon of Islamophobes worldwide, he is their Che Guevara and he will inspire more copycats in his wake." Just one problem with their silly analogy: They fail to name exactly who treats him as an "icon" or exactly who treats him like the left treats Che Guevara, with t-shirts and posters celebrating him. The counterjihad, so far, has condemned Breivik and called for his execution. As at 2016, there have been a distinct lack of "copycats". Instead, Europe suffers a wave of Islamic terror attacks. Islamic fascists attack apostates at an asylum-seekers' centre in Norway, Aug 2011. Islamic terror plot against Kurt Westergaard in Norway, Sept 2011. Two Muslims who converted to Christianity are stabbed by Islamofascists in Norway, Jan 2012. Norway provides safe haven on an ongoing basis to leading Iraqi terrorist Mullah Krekar. The Munich shooting in July 2016 was claimed to be inspired by Breivik, even though the shooter was an Iranian Shia Muslim. 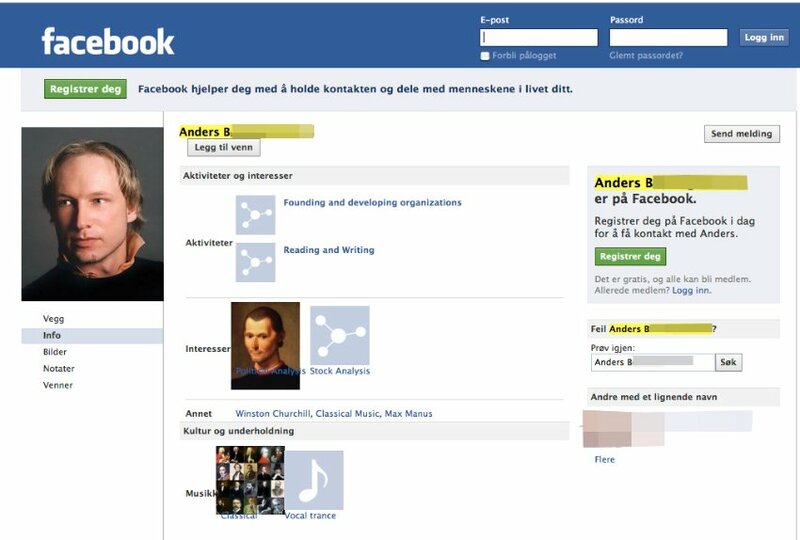 It was claimed the shooter used Breivik's picture on his WhatsApp account, though no screenshot of this emerged. It may seem unlikely that a Muslim would be inspired by an anti-Muslim radical. However, maybe he was if he was crazy. See the following. He recently grew a beard. He shouted "Allahu Akbar" while killing. He spent 2 months in a clinic for psychiatric treatment. He converted from Islam to Christianity. He changed his name from Ali to David. As an Iranian, he considered himself Aryan. He hated Turks and Arabs. He targeted youth of Turkish and Arab origin. He was inspired by Breivik. Here's a mad idea: Could all these things be true? Whether all, or just most, of these things are true, I think it is clear that the Munich shooter is one of a kind. We've never seen anyone like him before. Norway - Is the counterjihad to blame?